which has a good effect in health recovery and making the skin fair. 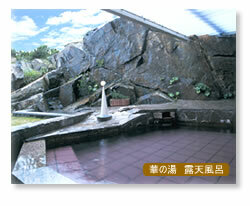 Enjoy the "rejuvenating hot spring" of the Ako Hot Spring besides a beautiful scenery in the Inland Sea national park. The hot water of Ginpaso is all of natural hot spring. 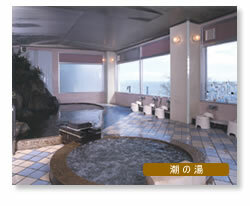 The quality of the Ako Hot Spring is featured by strong chloride and low salt. Being effective in neuralgia, rheumatism, chlonic digestive diseases, sensitivity to cold, and the like, this hot spring is known as an out-of-the way place of a hot spring, yet it is more popular for a good location including a hot spring. For instance, the Inland Sea exists just before the open-air bath. The sea and islands you overlook are characteristic of the Inland Sea national park. There is a promenade too just by the sea, and how romantic your stroll is in the sunset! Herb steam sauna "Scent Garden"
skin becomes beautiful. 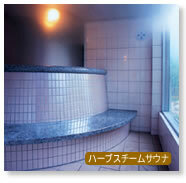 This sauna is a perspiratory bath popular with wemen and old people.